Genetic sequencing to reveal inherited traits such as high risk breast cancer gene BRCA1 has been banned in China until adequate standards can be set, the Beijing News reports. The order was made by the China Food and Drug Administration (SFDA) and the National Health and Family Planning Commission. 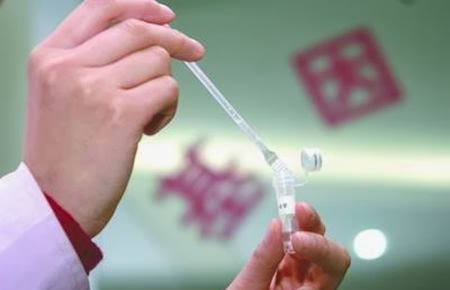 An official said DNA sequencing was being promoted by some clinics and companies at the costs of thousands of yuan to detect conditions such as cancer, but the testing technology had not been authorised or verified and the charges not standardised. Rural patients with dementia or depression have death rates three to four times higher than those of their urban counterparts, a study from Anhui has found. A shortage of blood group O supplies in Beijing has caused the cancellation of elective surgery for many patients. The Beijing Daily reports that a 47-year old man who required cardiac surgery had his operation postponed because there was no blood group O available, only the more common B group. The man's family tried to donate blood but they found they were all group B. A return to the man's home town to try find donors from friends and family also proved unsuccessful. The man and his family resorted to placing adverts in the Beijing newspapers to try solicit blood donations. Doctors said the New year period was always a time of blood donor shortages as the traditional sources of blood donation - students - went home for extended periods. Chinese people are subject to far too many useless, dangerous and wasteful medical tests in routine check-ups, an article Global Times claims. Citing the experiences of a visiting US physician, the Times asks why so many tests such as X-rays are offered as art of compulsory regular medical check for employment and other purposes when there is little scientific evidence to support them. Chinese clinicians agreed, putting much of the blame on private clinics which they said offered 'warmer service' but which exaggerated the risk of illness and the need for investigations. Clinic staff often act more like sale people than doctors and they offer unnecessary tests to an unwary public who do not have the medical knowledge to make an informed decision, the experts said. One group has estimated that the health checks market will be worth 300 billion yuan ($49.44 billion) by 2020.